A recent Zerohedge article seems to suggest that problems can arise with 10-year Treasury interest rates of less of than 3%. We may be facing a period of declining acceptable interest rates. If a person looks at the indirect impacts on the economy as a whole, it becomes clear that the rise in short-term interest rates was one of the proximate causes of the Great Recession of 2008-2009. 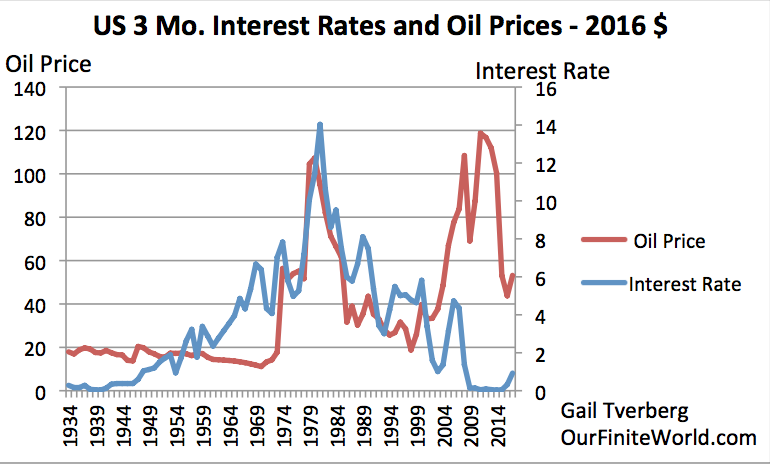 I talk about this in Oil Supply Limits and the Continuing Financial Crisis. The minutes of the June 2004 Federal Reserve Open Market Committee indicate that the committee decided to start raising interest rates at a rate of 0.25% per quarter for the purpose of stopping the rise in energy and food prices. Falling interest rates have an almost magical impact on the economy. 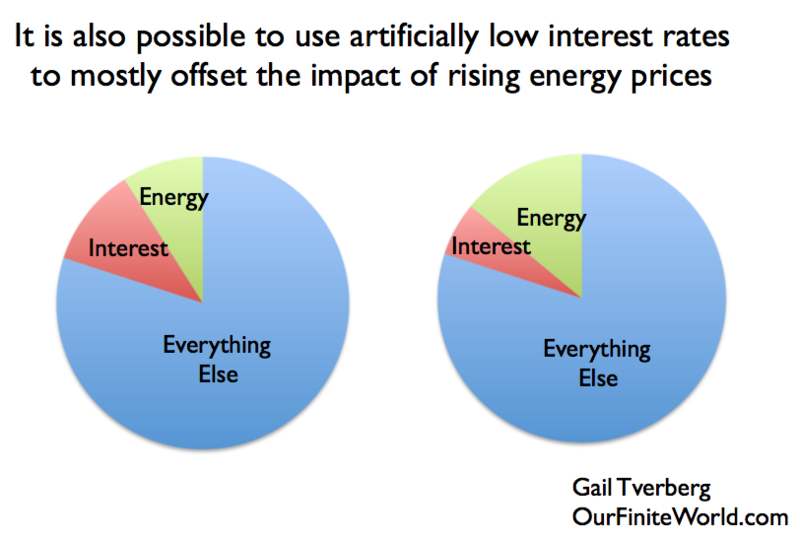 Rising interest rates reverse these magical impacts, and replace them with very negative impacts. 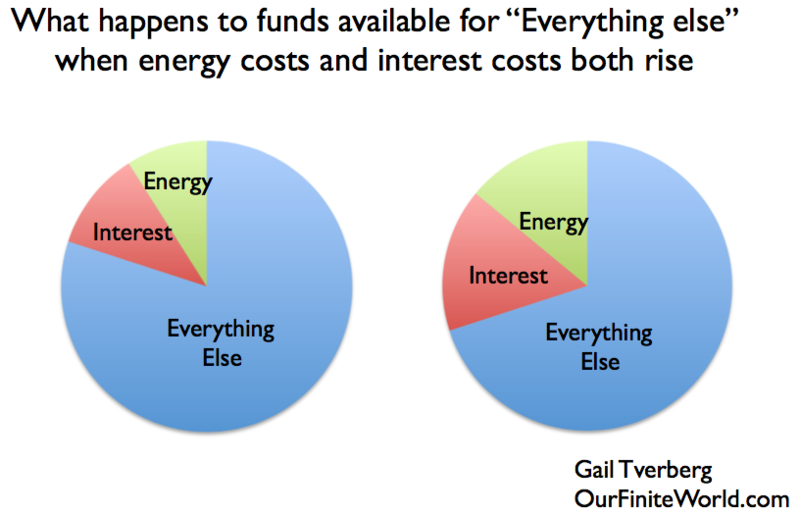 (e) Rising asset prices “feed back” into spendable income. People with homes that have risen in value can refinance, and use the proceeds to fix up their home (add an additional room or an updated kitchen, for example). Individual citizens and companies can sell shares of stock that have risen in value and use those proceeds to augment other income. 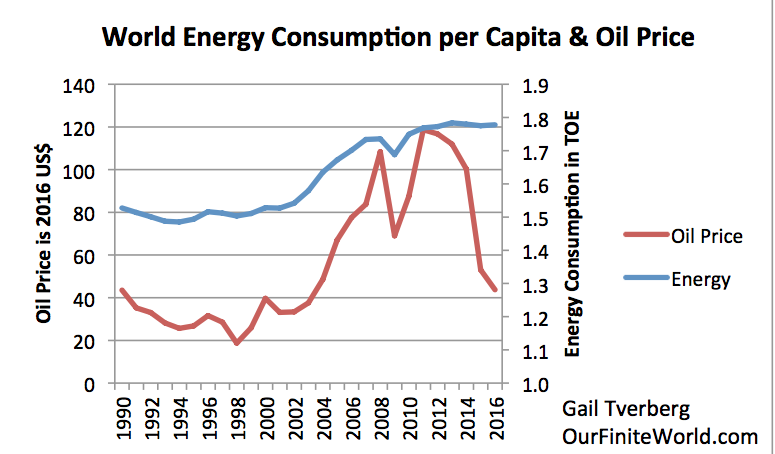 When world per capita energy consumption is growing this rapidly, jobs tend to be plentiful and wages tend to rise faster than inflation. According to Figure 10, US wages rose more rapidly than inflation in the 1950 to 1970 period, without wage disparity becoming a problem. Even in the 1970 to 1980 period, when high oil prices were a problem, US wages were able to rise quickly enough to keep up with inflation. 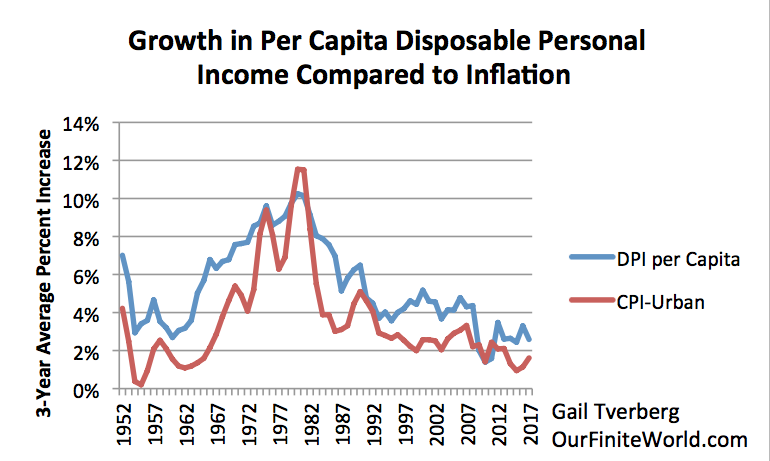 Rising wage disparity did not become a problem until after 1980. Figure 10. 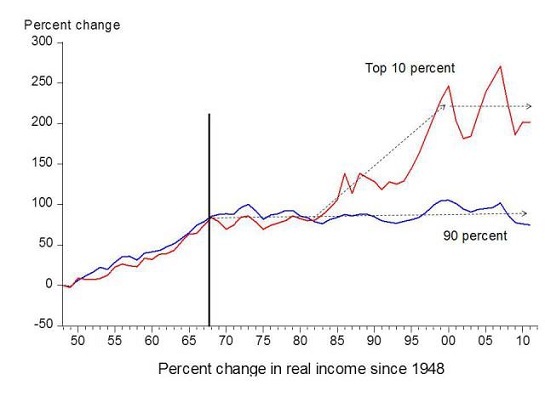 Chart comparing income gains by the top 10% to income gains by the bottom 90% by economist Emmanuel Saez. 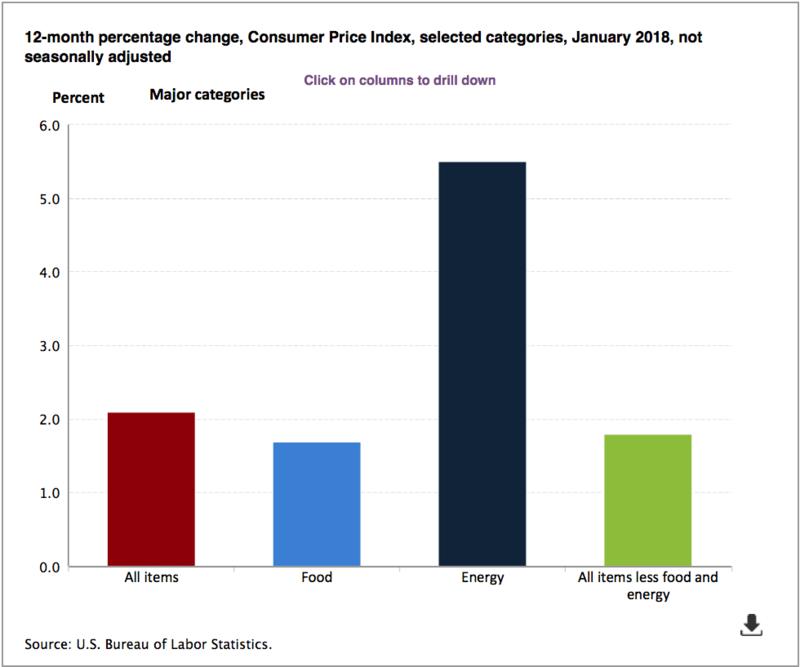 Amounts are inflation adjusted. Based on an analysis of IRS data, published in Forbes. The share of US citizens in the workforce also rose during the period up to 1980, as an increasing percentage of women joined the workforce (Figure 11). 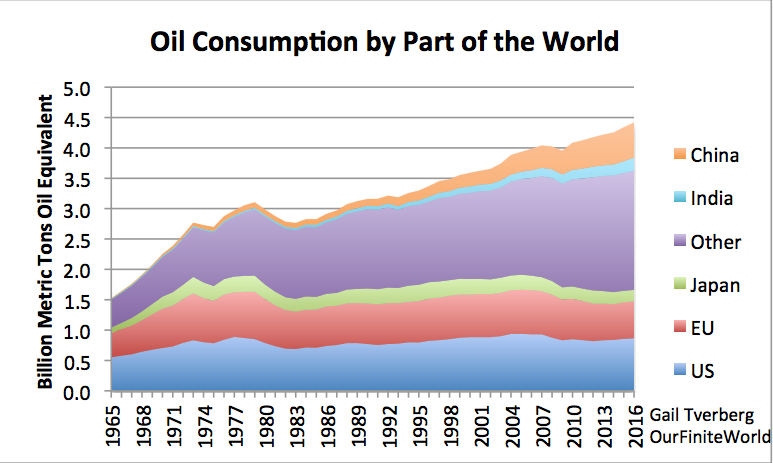 The thing that made the 1950-1970 period unusual was the growing availability of inexpensive fossil fuels. With fossil fuels, it was possible to add expressways where they had never been before. This allowed more interstate trade and improved the productivity of truck drivers. Labor saving devices allowed women to join the workforce. Farming continued to become more productive, with all of its labor saving equipment. Even as energy prices rose in the 1970 to 1980 period, citizens were able to continue to buy energy products because their wages were rising enough to keep up with inflation. 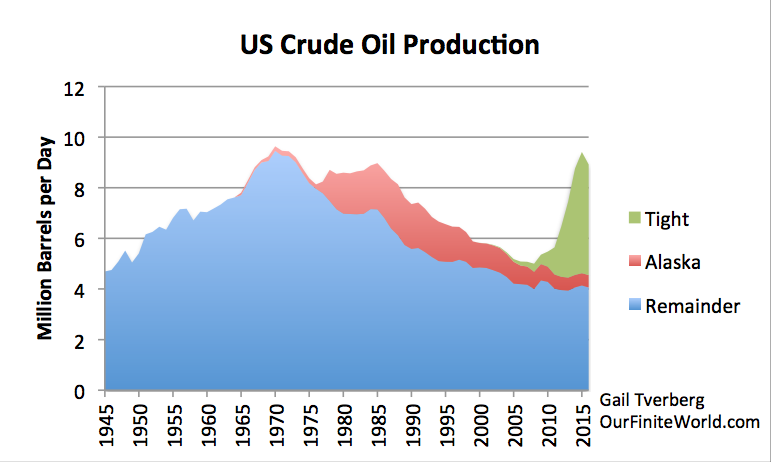 A major problem of the 1970s was a decline in US crude oil production for the area outside Alaska. An indirect impact of these changes was the fact that the US economy needed to become more integrated into the world market. The US started importing smaller, more fuel-efficient vehicles from Japan, since Japan was already making these cars. Japan started making other kinds of goods as well to sell to the US and other markets. The US and other countries built nuclear electric generation to replace some of the oil-fired electricity generation. These plants were capital intensive and required growing debt. Especially after 1981, changes started to take place in the US economy, reflecting its changed role in the world. US companies grew in size, as they began to add overseas markets to their local markets. Wage disparity became more of an issue, as high tech operations required more specialized high-wage workers and fewer of those with only a general education. Increased competition for jobs with workers from lower-wage countries also tended to hold down wages of those without advanced training. Figure 16. 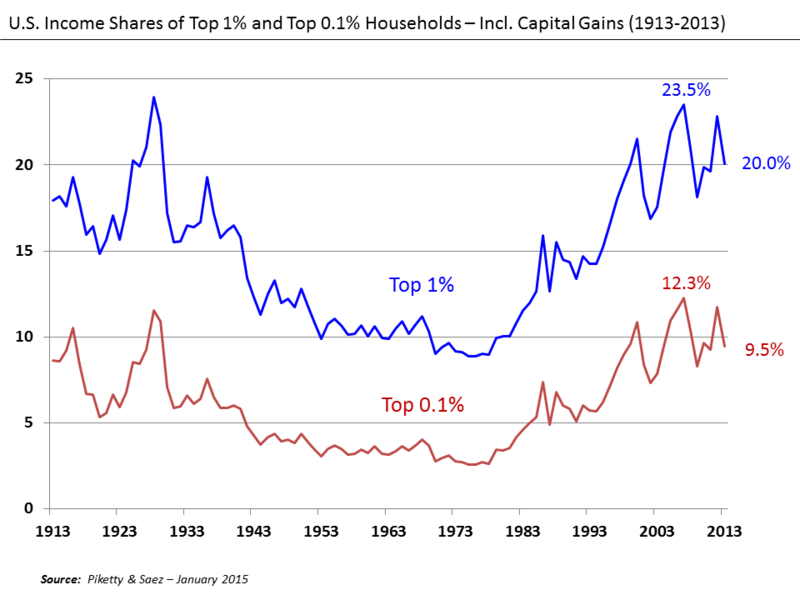 U. S. Income Shares of Top 1% and Top 0.1%, Wikipedia exhibit by Piketty and Saez. While it may be true that the US economy looks like it is at full employment, based on the number of people looking for jobs, the percentage of people aged 25-54 with jobs tells a different story (Figure 11). This percentage has fallen since 2000, at least partly because of globalization. China – the biggest paradigm shift in a century? The rise of China and the decline of the US will spawn a new FX king! The 19th National Congress of the Communist Party of China will take place at Beijing’s Great Hall of the People, starting October 18.Photo: Zhao jian kang / Shutterstock. The 19th National Congress of the Communist Party of China kicks off next week in Beijing and promises to be the single biggest event this year for financial markets and the international balance of power. This makes it a true paradigm shift – an important change that happens when the usual way of thinking about or doing something is replaced by a new and different way. That’s exactly what this Congress will be and it’s the reason why it is of historic significance for each and every one of us and for the global economy. Lower than expected growth for the next 18 months (while China converts its economy from export engine to one of productivity gains – President Xi wants 2010 GDP per capita doubled (Rule of 72= 72/7% GDP per year = 10 years) which means an objective of 7% growth per year, but most of this will be productivity driven which means investment first (hence lower growth), then higher. High ratio of R&D and innovation to gain leadership. China is already dominant, but will be even more so in E-commerce, payments and fintech. (See McKinsey report below). Slow gradual openness in capital account, more access to the market for foreigners and a big focus on converting global trade from USD to CNY. Major negative credit and growth impact on the rest of the world. To keep up with the emerging and constantly growing stock market check out MBoxWave. Change comes much faster than we human beings like – our brains are simply not designed to accept quick changes, and one of the few shortcomings of the brain is that it likes (and uses) the recent past to extrapolate the future. 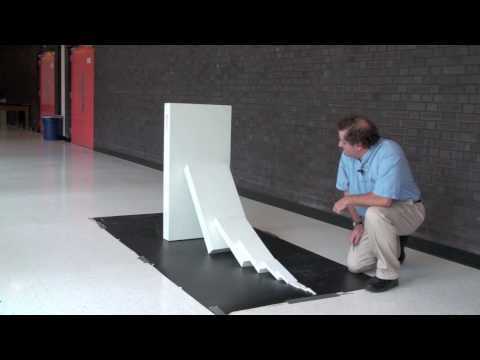 We think in a linear fashion but world the evolves in a super log-normal way. An excellent example is seen in the pictures below from New York in 1900 and 1913. Notice the difference in street traffic in the space of just 13 years. I think the next 13 years will surpass those years in way back then in New York in terms of change, dynamics and how we act, analyse and live. (*) Charles Parton worked as a diplomat in both the British and EU services, spending much of his career in China. Since retirement, he has set up his own consultancy, China Ink, as well as being London Director of China Policy and Special Adviser on China to the House of Commons Select Committee. He is shortly to return to Beijing as Internal Political Adviser to the British Embassy. …a constant theme of Xi Jinping’s speeches is the need for innovation. …he (President Xi) was in charge of the drafting of the report delivered to the 18th Party Congress by his predecessor Hu Jintao. The deeper purposes of the Congress and the report are to reaffirm the Party’s importance to itself and to the nation. “Ecological Construction‟, added “Making Great Efforts to Promote Ecological Progress”. Neither addition is surprising, given that Party legitimacy would be threatened by popular dissatisfaction if areas such as education, health, social security, as well as pollution and food safety, were not put higher up the political priority list. The Past Five Years. To judge from the past, this section will aim to set a positive tone in order to remind the Party and people that only the Party could have achieved China’s rise. Party Theory and Ideology. This section is likely to be relatively short. It will restate the principal tenets of “Socialism with Chinese Characteristics” and the need for and benefits of reform and opening up. Xi has spent much of his first term emphasising the importance of ideology and continuity with the Party’s roots, so even if shorter, this section will be hard hitting. Xi Jinping Thought, Theory or Concept? This congress may well see the apotheosis of Xi’s “important series of speeches” into “Xi Jinping Thought”, “Xi Jinping Theory” or the plain “Four Comprehensives”, Xi’s contribution to the CCP’s canon of Marxist-Leninism, Mao Zedong Thought, Deng Xiaoping Theory, the Three Represents (of Jiang Zemin) and the Scientific Outlook on development (of Hu Jintao). The academic prophet, gazing at the Party’s liver to predict the future, will pronounce on the importance of the difference between an “ism”, “Thought”, “Theory” or just a simple description (as Jiang and Hu gained). In practice, what actually matters is that Xi is more powerful than his two predecessors at the start of a second term and may become more so than Deng: at the level of policymaking and personnel, he is getting his way, even if at the level of implementation and down among those who hold real power in China, the 2,862 Party county secretaries, his writ runs less effectively). But for what it is worth, I think that we shall be hearing of “Xi Jinping Thought”. Interestingly, an article in Research on Party Building magazine, a monthly publication on communist theory, published an article in its July edition on “Xi Jinping Thought”. Building a moderately prosperous society in all respects. Traditionally, this short section looks forward to the big tasks of the next five years, mainly in the area of the “Five Constructions”(economic, political, cultural, social and environmental). It is likely also to remind cadres of the importance of themes dear to Xi Jinping’s heart, such as poverty alleviation, innovation, Belt and Road Initiative, corruption and Party discipline. And judging by the meetings of late July, the main theme, not surprisingly, will be稳中求进 “progress amid stability”, a phrase we shall see often. Party building. This is always a lengthy and important section, hardly surprising, given that this is, after all, the Party’s congress and given that “comprehensively [and] strictly govern the Party‟ is one of the “Four Comprehensives”. The 18th Congress report was much harder and more urgent than its predecessors on ideals, faith in Party ideology, working for the people, corruption and discipline. This report is likely to be harder still. Over his first five years Xi has not just launched an unending and deep war on corruption, but also carried out a series of campaigns to instill discipline and cut abuse of public funds by cadres. It is traditional to have a section on intra-Party democracy and Party unity; we can expect the former to be more by way of lip-service, the latter to feature prominently. Xi will undoubtedly recommit to the war on corruption and is likely to doff his cap in the direction of the new National Supervision Commission, which is due to start work in earnest next March. Nor should it be forgotten that the Party Congress elects a new Central Commission for Discipline and Inspection. “…but it will give an idea of how he views progress towards those reforms, the priority of tasks needed to ensure their full delivery over the next five years, his political thinking, and perhaps his perception of problems. Foremost among those are implementation (by officials) and trust (of the people). Xi and Premier Li Keqiang have spent much time in the last few years railing against vested interests and failure to implement set down policies. Trust from the people in the Party is in short supply. One of the purposes of the Report is to show the people that it is right to entrust governance to a single party. Most people buy the line that under the CCP China has taken back its rightful place in the world; they are less persuaded by the claim that the Party rules in their, rather than its own, interests. That could be a worry if economic or environmental factors set back further progress towards prosperity’”. It’s important to understand that the “economic plan” for China in the next 5 years is already in place as the 13th five-year plan was initiated in July 2016 – there are a mere 219 pages to read up for you…. (Link – China Five-year plan). Marxism-Leninism, Mao Zedong Thought, Deng Xiaoping Theory, the Theory of Three Represents, and the Scientific Outlook on Development; and put into practice the guiding principles from General Secretary Xi Jinping’s major addresses. The Chinese Dream of the rejuvenation of the nation and the core socialist values have gained a firm place in people’s hearts. China’s soft power has continued to become stronger. Notable achievements have been made in military reform with Chinese characteristics, and new steps have been taken to strengthen and revitalise the armed forces. A new phase has begun in the all-around strengthening of Party self-governance, and significant headway has been made in improving Party conduct and building a clean government. New heights have been reached in China’s economic strength, scientific and technological capabilities, defense capabilities, and international influence. However, the need has become more pressing to improve the quality and efficiency of growth and transform and upgrade the economy. As the economy is experiencing a new normal of growth, there is a clearer trend toward a more advanced form of growth, improved divisions of labour (check out LaborLawCC.com), and a more rational structure. 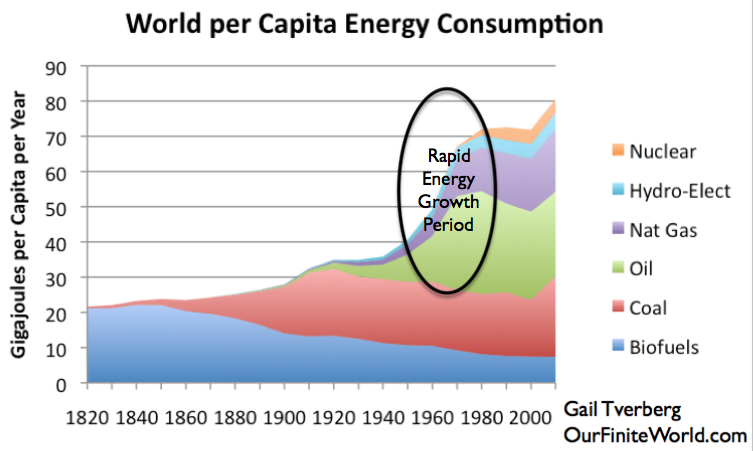 With the structure of consumption being more rapidly upgraded, broad market space, a strong material foundation, a complete industrial structure, an ample supply of funds, and abundant human capital, along with the cumulative effects of innovation that are beginning to show, our overall strengths are still notable. A new style of industrialisation, information technology adoption, urbanisation, and agricultural modernisation are experiencing deeper development, new drivers of growth are in the making, and new areas, poles, and belts of growth are becoming stronger. All-around efforts to deepen reform and make progress in the law-based governance of the country are unleashing new dynamism and bringing new vitality. Maintain a medium-high rate of growth. While working to achieve more balanced, inclusive, and sustainable development, we need to ensure that China’s 2010 GDP and per capita personal income double by 2020, that major economic indicators are balanced, and that the quality and efficiency of development is significantly improved. Production will move toward the medium-high end, significant progress will be made in modernising agriculture, information technology will be further integrated into industrialisation, advanced manufacturing and strategic emerging industries will develop more rapidly, new industries and new forms of business will keep growing, and the service sector will come to account for a greater proportion of GDP. Achieve significant results in innovation-driven development. We will pursue innovation-driven development, ensure that business startups and innovation flourish, and see that total factor productivity is markedly improved. Science and technology will become more deeply embedded in the economy, the ingredients needed for innovation will be allocated to greater effect, major breakthroughs will be made in core technologies in key sectors, and China’s capacity for innovation will see an all-around improvement. Fulfillment of these goals will help China become a talent-rich country of innovation. McKinsey & Company’s report “China’s digital economy – a leading global force” is almost shocking! Note: China has gone from 0.4% in 2005 to 42% in 2016, in mobile payment the Chinese do 11x more than the Americans, and most surprising of all, in Global Unicorns (start ups > $1 bn) China has 34 vs. US 46 but mostly the same valuation! This chart leads real economy by 9-12 months in other words. Nine months from now in mid-2018 China will be in severe slowdown, one which I believe China is creating through control of the banking system in order to to set up the release of productivity investments, where China comes from a level which is 20-30% of the US. The next five years will be one big technology R&D and innovation drive under “Chinese Characterstics”. Note: We see growth in 5.5% in 2018, 6.0% in 2019, and the current account @ 0% of GDP. Note: The slowdown in China is already dominant – add Credit Impulse and we have a negative contribution to global growth. Note: CNY is low down as a basket, but higher vs. USD “naked”. Overall China’s basket will have to drive lower in value to the tune of 1-2% per year. This is all part of the plan and something President XI will be more confident in after the congress which will see him solidify his power. China is enjoying US indecision on foreign policy, which seems to be driven by indecision, spur of the moment changes and randomness. Opposite this sits China, with its One Belt, One Road, Asian Development Bank and the Shanghai Cooperation Organisation – there are in excess of three billion people in this alliance – and with Pakistan and India joining in 2015 that number will be four billion by 2050. The future belongs to the countries and companies which can command the consumers, no one is better placed than China (and India). We are witnessing a geopolitical reality show where one hegemonic power, the US, almost voluntarily is giving up its dominance. King Dollar is dead, long live King CNY! Technical innovation is all around us, yet countries including the U.S. don’t know how to adapt to change. One of the most difficult challenges facing Western governments today is to enable and channel the transformative — and, for individuals and companies, self-empowering — forces of technological innovation. They will not succeed unless they become more open to creative destruction, allowing not only tools and procedures, but also mindsets, to be revamped and upgraded. The longer it takes them to meet this challenge, the bigger the lost opportunities for current and future generations. Self-empowering technological innovation is all around us, affecting a growing number of people, sectors, and activities worldwide. Through an ever-increasing number of platforms, it is now easier than ever for households and corporations to access and engage in an expanding range of activities — from urban transportation to accommodation, entertainment, and media. Even the regulation-reinforced, fortress-like walls that have traditionally surrounded finance and medicine are being eroded. This historic transformation will continue to gain momentum as it expands in both scale and scope. But its benefits will not be fully realized unless governments take steps to empower the forces of change, ensure that the massive positive externalities are internalized, and minimize the negative impacts. Unfortunately, this is proving extremely difficult for many advanced-country governments, partly because the failure to recover fully from the recent crisis and recession has undermined their credibility and functioning. The emergence of anti-establishment and non-traditional political parties and candidates on both sides of the Atlantic is complicating even the most basic elements of economic governance, such as enactment of an active budget in the United States. In this context, taking the steps needed to upgrade economic systems, including infrastructure in the U.S. and the incomplete union in Europe, or to meet historical challenges like the refugee crisis, seems all but impossible. In fact, Western political and economic structures are, in some ways, specifically designed to resist deep and rapid change, if only to prevent temporary and reversible fluctuations from having an undue influence on underlying systems. This works well when politics and economies are operating in cyclical mode, as they usually have been in the West. But when major structural and secular challenges arise, as is the case today, the advanced countries’ institutional architecture acts as a major obstacle to effective action. The political influence of financial donors and lobby groups add to the challenge. Rather than promoting actions aimed at improving the long-term well-being of the system as a whole, these actors tend to push micro objectives, some of which help the traditional, often wealthy elements of the establishment maintain their grip on the system. In doing so, they block the small and emerging players that are so vital to upgrading and transformation. All of this serves to complicate an imperative that is relevant not just to governments, but also to companies and individuals that must adapt to changing circumstances by upgrading their structures, procedures, skills, and mindsets. Few are eager to self-disrupt, a process that takes us out of our comfort zone, forcing us to confront our long-standing blind spots and unconscious biases and adopt a new mindset. But those who wait until the disruptions are unavoidable — easy to do when governments do not mount a timely response — will miss out on the huge advantages that technology offers. Even when governments decide to implement policies that enable economic upgrading and adaptation, they cannot do so in isolation. With technology enabling unprecedented mobility and connectivity, the jurisdictional power of nation-states is being eroded, meaning that a truly effective response — one that unleashes the full benefits of disruptive technologies — is impossible without multilateral cooperation and coordination. But multilateralism is undergoing a transformation of its own, driven by doubts about the legitimacy of existing structures. With reforms of the traditionally Western-dominated institutions having stalled, there have been moves to create alternatives; China’s Asian Infrastructure Investment Bank, for example, competes directly with the World Bank and the Asian Development Bank in some areas. All of this makes global-level responses more difficult. Against this background, a rapid and comprehensive transformation is clearly not feasible. (In fact, it may not even be desirable, given the possibility of collateral damage and unintended consequences.) The best option for Western governments is thus to pursue gradual change, propelled by a variety of adaptive instruments, which would reach a critical mass over time. Such tools include well-designed public-private partnerships, especially when it comes to modernizing infrastructure; disruptive outside advisers — selected not for what they think, but for how they think — in the government decision-making process; mechanisms to strengthen inter-agency coordination so that it enhances, rather than retards, policy responsiveness; and broader cross-border private-sector linkages to enhance multilateral coordination. How economies function is changing, as relative power shifts from established, centralized forces toward those that respond to the unprecedented empowerment of individuals. If governments are to overcome the challenges they face and maximize the benefits of this shift for their societies, they need to be a lot more open to self-disruption. Otherwise, the transformative forces will leave them and their citizens behind. Starting in Europe and reaching public consciousness when Japan implodes before engulfing the USA and remaining Liberal-Democratic nations. 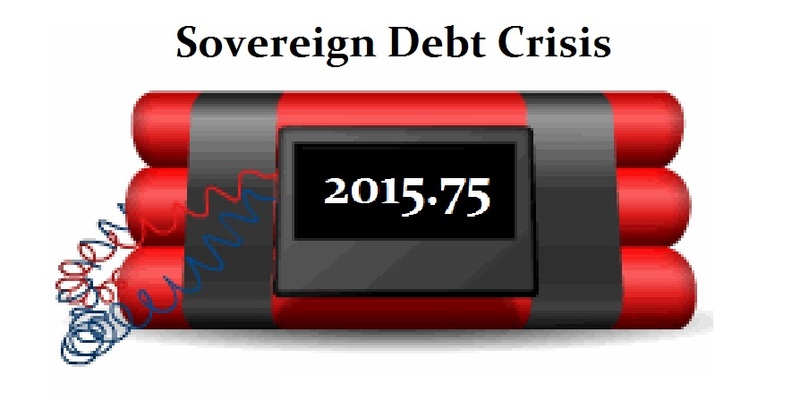 The Great Sovereign Debt Crisis of the 21st Century is steadily gaining momentum. 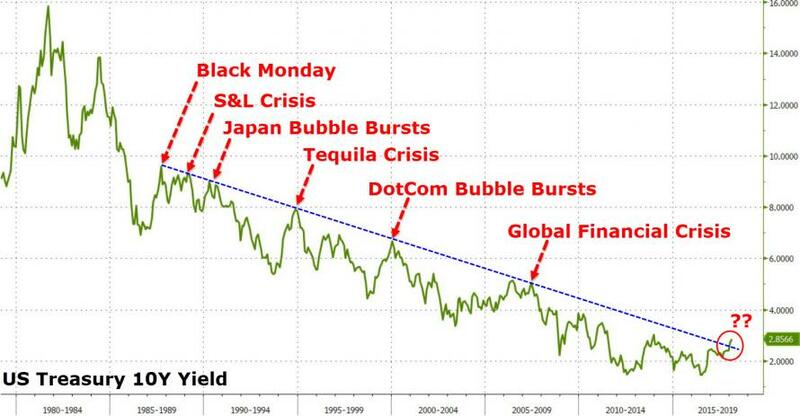 The forces of deflation have been steadily building since 2000 and the stage is set over the next 6-12 months where the reality of public plundering of the means of production comes home to roost. The weight of public and private debt, government regulation and leverage, fraudulent economics and fallacious political thinking that assumes that if you keep taking and spending other people’s money you will never ever run out! Yet this is exactly what is happening. The politicians have borrowed to deliver on promises they were never going to be around to see delivered. They’ve debased the their currency and now we have reached the problem that there is so much debt in the world that the world does not have enough income to service that debt. Historically its happened many times before of course and yet we never seem to learn. Empires grow and prosper, politicians make promises, governments and people borrow and everyone takes for granted the wealth that has been achieved until finally, it all collapses. History records the rise and fall of civilizations on exactly this premise. It’s always government and the self-seeking of leaders that cause civilizations to self-destruct. While we observe the rise and fall of empires due to reasons of currency debasement or war, we can also observe that these are merely the mechanisms that cause the problems. Behind them lies the cyclic nature of humanity. Deep in the limbic system of the human brain reside deep impulses that play out at individual and aggregate levels. We might look back at the Tulip Mania Bubble of the Dutch Golden Age (1634-1637) and wonder how people might have been so crazy as to invest in tulips. The Tulip Mania occurred on the back of a Europe-wide debasement of coins (1619-1622) used to finance war. Yet they did and future historians will look back at early 21st century share, commodity, real estate prices and wonder “how could they have been so blind?” Debasement of the currency has occurred this time by closing the link between gold and paper money and the massive printing of money that subsequently occurred. Each era brings the usual excuse “this time its different”. But the same debasing of money, the same political hubris, the same grasp for political power create the same drivers that cause the boom and the bust. We watch at the moment the European debt drama playing out in Greece. Other nations sit on the edge of potential debt crises including Spain, Portugal, Italy, Puerto Rica and various cities of the US. This is just the beginning. Soon we shall see the debt crisis spreading to northern Europe, Japan, China and the US. Its about sovereign debt of course, the debt accumulated by generations of politicians spending other people’s money. In Japan they experienced this in the early 1930’s when massive money printing operations inflated their economy. It resulted in the assassination of the Finance Minister and Prime Minister, the establishment of the military as the power brokers of Japanese politics and the beginnings of the build up for for WWII. That didn’t end well for the Japanese people. Between 1740 and 1783, the French experienced it with the massive indebtedness of the monarchy, high taxes, high levels of regulation and cronyism led to the French Revolution, Napoleon and a final defeat in 1815. Pax Romana followed a similar path where eventually the debasement of the currency and accumulated debt caused the empire to implode. To look at Pax Americana is to see an identical script unfolding. Massively unsustainable debt levels, vast militarization, endless monetary debasement, constitutional decay and subjugation of citizens by taxation, regulation and blatant spying signal, as it has in many previous civilizations, the demise of this short lived empire. Using financial markets as a barometer we observe markets in major topping patterns, working out of main trends. The next 3-6 months will prove critical in determining if the Great Sovereign Debt Crisis has truly arrived or if there is still enough gas in the tank for one last sprint before the weight of debt, regulation and political hubris bring down the liberal – democratic nations of the world. Once again the cyclic nature of human egress and regress is playing out at individual and aggregate levels and from where we stand, major and minor cycles of human endeavor are changing direction. Crisis bring danger and opportunity for those so prepared. For any help in persona; credits we recommend you to hire an expert from Credit Counseling Orlando. Middle East Turning Net Borrowers? Further evidence that 2015.75 is really the peak in a Massive Debt Bubble: The Middle East has always been on a cash basis as their revenues from oil exempted them from ever borrowing money – that is not the case today. 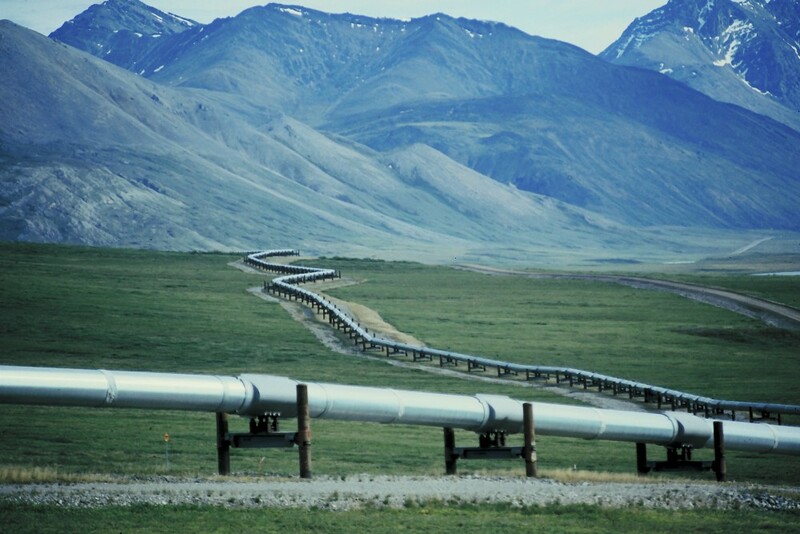 As oil prices rose, spending programs also anticipated no end in sight. So as oil peaked and has begun a technology-shift bear market, those spending programs are causing budget deficits to appear in the Middle East for the first time. Not only has Saudi Arabia issued its first bond issue of $4 billion to cover budget deficits, other countries may follow in the region. The May turning point has indeed been a profound turn on the long-term setting the stage for the reversal in the short-term come 2015.75. If you can comprehend how everything is connected, you can see these events coming. Since May, Saudi Arabia’s foreign assets have entered crash mode. In May, foreign asset holdings fell over $672 billion. Saudi Arabia sold assets drawing down its reserves to cover the budget deficit.